If you can dream it, we'll help you do it. 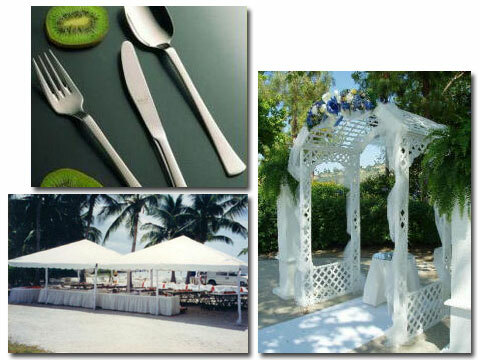 Planning a wedding, party or other special event in the Florida Keys? Visit our store and you will find everything from beautiful tents to tables and chairs, including frozen daiquiri machines, champagne fountains, and a portable bar. You can create the ambience you want ... wherever you want ... next to the beach, in a park or in your own back yard ... with a spacious tent and accessories. Add fun and flair with mood-setting lighting and keep dishes hot and delicious ... or cool and refreshing ... with easy-to-use rental equipment. Whether the effect you want is pure tranquility or pure energy, renting from Four Star Rentals can make your event fun-filled affordable and unforgettable. It's easy ... with help from your Four Star Rentals store. To throw the party you've been dreaming of ... just rent the things you need. If you can dream it, we'll help you do it.